to read what she and everyone else have not been doing this week about her precious baby boy, Stellan, who is having major heart surgery as I am posting this. Praying for you, sweet Stellan, and for the entire MckCrew. But first, hang out to see what we've NOT done at our house this week! 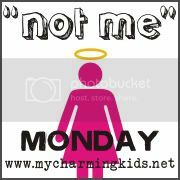 I'll start right out with how I did NOT skip last week's edition of Not Me! Monday! How I was NOT so far behind on so many other things that it just didn't happen. As a new blogger trying to make sure I don't miss a thing, I certainly would not have missed such a big blog hop. I also did NOT decide totally at random to go ahead and make another batch of mini-cheesecakes. I certainly would NOT do any such thing for just the five of us, as I only will do fabulous things like that when we are expecting company! I did NOT put off assembling fundraising packets this weekend because, well, I was NOT watching football. I managed to NOT do a pretty poor job at both projects. Now I do NOT have a huge stack of stuff to try to finish tonight, around teaching tax students about IRA's! That's some of the things I did NOT do this last week. How about you!? Throw yours in the comments below, or onto your blog and link over! i did not make 18 smores in the oven and eat them all by myself at 11 o clock at night while watching chelsea lately! ha!